Polished Concrete is simply concrete that is ground with abrasive discs of varying grit sizes, and then densified in order to make it smoother, shinier, and harder. Depending upon the amount of grinding, polished concrete can exhibit a “salt and pepper” finish where only small specks of sand are exposed, or it can resemble terrazzo which shows larger exposed stones. 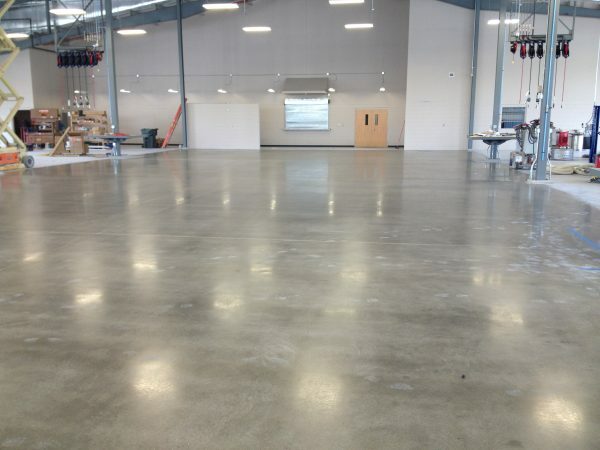 Polished concrete can either be dyed or left in its original gray state. Concrete which has been polished does not need a top coat of sealer to make it shiny. The gloss comes from the polishing process. Therefore, polished concrete requires far less maintenance which makes it superior to other types of floors in terms of durability.